Light Novel Review: Strawberry Panic! Posted on July 27, 2013 by Lena K.
So for now, this is my first and probably only review of a Light Novel and that’s actually no surprise, considering the fact that Strawberry Panic is also the only translated yuri Light Novel that I know (other than the Sono Hanaibra ones). I don’t really know how to organize this review or what kind of aspects beside the story and the author’s writing style I should really mention, so bear with me with this one. This light novel has been around for quite some time already, but I first came across this only some weeks ago, when someone on Twitter recommended me to read this novel. So now I got it, well so far only the first out of the 3 volumes but anyway, let’s start the review. So first things first, what this book is all about is the life of a few young girls that attend either of the three affiliated all-girl schools on Astraea Hill. Let me just skip the names and what each and every of the 3 schools are mostly known for and get straight to the characters. The first girl we get to know is Aoi Nagisa, a 15-year old transfer student, who’s entering this school in her 4th year. She’s the main character of this book and is presented to you as a cheerful and cute girl that seemingly attracts the attention of quite a few other students, like her roommate Suzumi Tamao, first year Tsukidate Chiyo or her sempai Hanazono Shizuma, who is easily one of the most popular girls in all Astraea Hill. Other than that we have a lot of important characters from all different schools, but the most important characters despite of course Nagisa and Shizuma, are Konohana Hikari, another transfer student and Otori Amane, who’s as well one of the school’s most popular students and who, thanks to her rather masculine appearance, most girls refer to as “Prince”. The first of the 3 volumes revolves around 2 major themes: For once we have the relationship between all the girls and trust me there’s a lot going on in this aspect and then there is the “Étoile” election. If you haven’t seen the anime and don’t know what that is all about, let me explain it to you. “Étoile” is the word they use for a specific pair of students that throughout a competition earn that title and thus become the figurehead of all the 3 schools. Needless to say this couple is pretty popular throughout all the schools and of course every school wants to have 2 of their own students to earn this title. So to make it short, other than the relationships between the characters, the Étoile election is the biggest part of the story of the first book. If you have already seen the Strawberry Panic anime adaption, you’ll most likely be acquainted with many of the happenings in this novel, but it turns out that the story of the light novel and the one of the anime are slightly different. So far I have only read the first chapter of the Strawberry Panic manga, but it’s clear that the manga rather follows the events of the novel and the anime is a little different from both of them. So if you liked the anime you should probably consider getting this novel since the story is quite different in many aspects. Now, what do I have to say about it? In the beginning, when I started reading this, I was a little wary at first. A complete novel translated into English is quite a lot of work to do and I already know that especially in Manga, some translation groups tend to pick some quite weird ways to paraphrase specific Japanese words or expressions, so I was surprised to find that Seven Seas actually did a great job with the translation. Not that I can compare it to any other Light Novel, but I especially liked the fact that they left some specific Japanese words as they are and just explained their meaning on a few additional pages. That’s a really nice way to not make this book loose it’s Japanese touch you could say. Other than that I can say that I pretty much enjoyed the writing style, the only thing that probably bothered me a little is the length of most scenes. Just when I start to get into a scene, it’s already over and a new one starts or some flashbacks happen and that just ruins the flow of the story at some points. I was also a little irritated at the amount of yuri scenes in this one, since it definitely shows more than what we saw in its anime. And even though it is nice to read about all the female characters having crushes on each other, it’s still a little too much. The school is even described as a place of “…friendship and love, as well as mental and emotional bonds and passionate physical aches.” And don’t forget that this is an all-girls school, a catholic one on top of that. But what am I even complaining about, the anime wasn’t that different and the idea that catholic all-girls schools are the perfect hot spots for young lesbians is also not new. 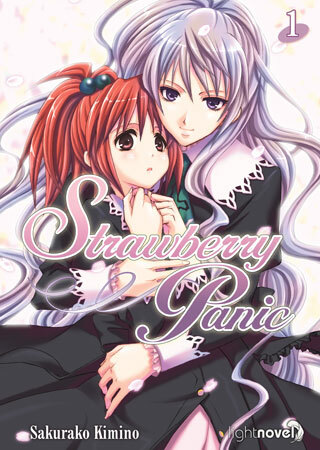 All in all I think this is a must-read for all the Strawberry Panic fans, especially the ones who like me, haven’t read the manga yet. I think yuri fans in general will come to like this one pretty much too, since the yuri content is really high and the story, even though completely unrealistic, is still very nice to read. This entry was posted in Light Novel, Manga Review, Other and tagged Sakurako Kimino, Strawberry Panic by Lena K.. Bookmark the permalink. I wonder if this is the volume where the Wunderkind known as Chikaru, announces her master plan to take over the world. The Yuri Nation knows that Chikaru is the president of all Asia and Osaka (Azumanga Daioh) is the president of the United States. These are undeniable facts. I have heard from others who have read the novels that Chikaru is planning global conquest so I will be patiently awaiting your review of the other volumes to leanr the truth…or you can tell me where you found this treasure of a novel and I can see for myself. But it seems it's out of stock, but I'm sure it won''t take long until they'll have it again. I still haven't finished the last Marimite season, I should really catch up on that soon and I didn't even know that there is a light novel out too.